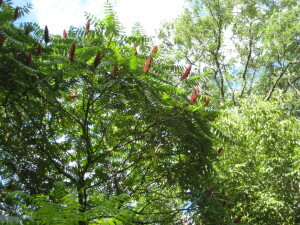 Staghorn sumac. 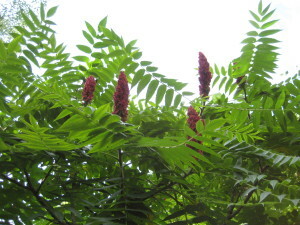 (Rhus typhina.) These dainty little trees are a common sight along roadsides. They seem to spring up everywhere, near dumps or malls or in weedy backyards. They’re the kind of tree no one notices. Except birds, of course, who love the sweet fuzzy berries, high in vitamin C and energy. But four hundred years ago, sumac seeds were almost literally worth their weight in gold. English botanists explored the New World in the early 1600s and were thrilled to discover a host of exotic species: exciting plants (which are ho-hum to us today) like goldenrod, sugar maples, white pines, and sumac. The explorers were looking for plants for commercial purposes, of course, for lumber and ship masts, medicine and food—but they were also looking for color. 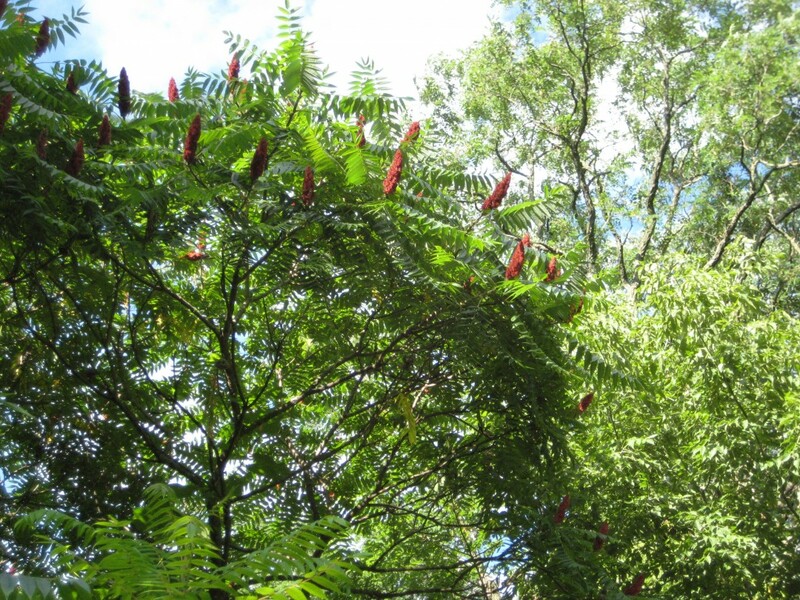 Staghorn sumacs were among the very first plants sent to Europe from the New World. 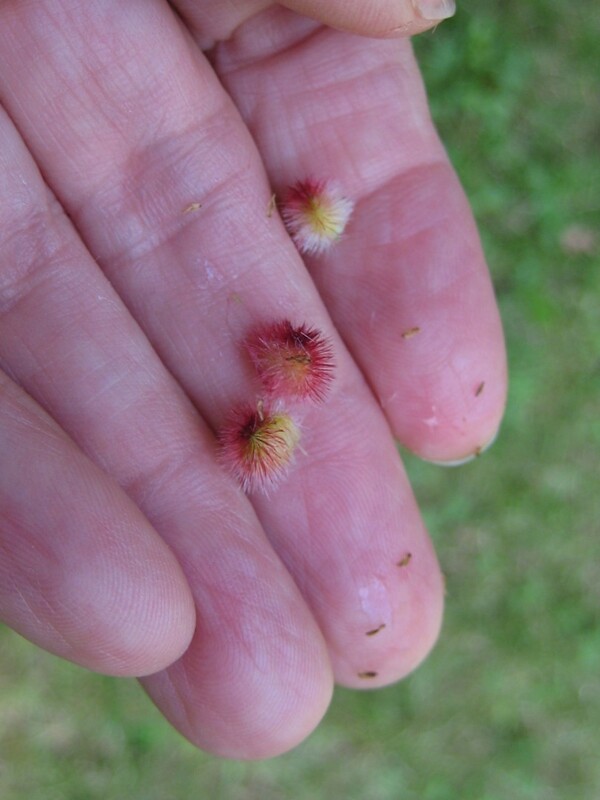 The fuzzy seeds and tiny saplings were carefully tended on the long sea voyage, pampered and guarded from salt spray and cold winds far more carefully than were the human passengers. Sumacs were worth big money. 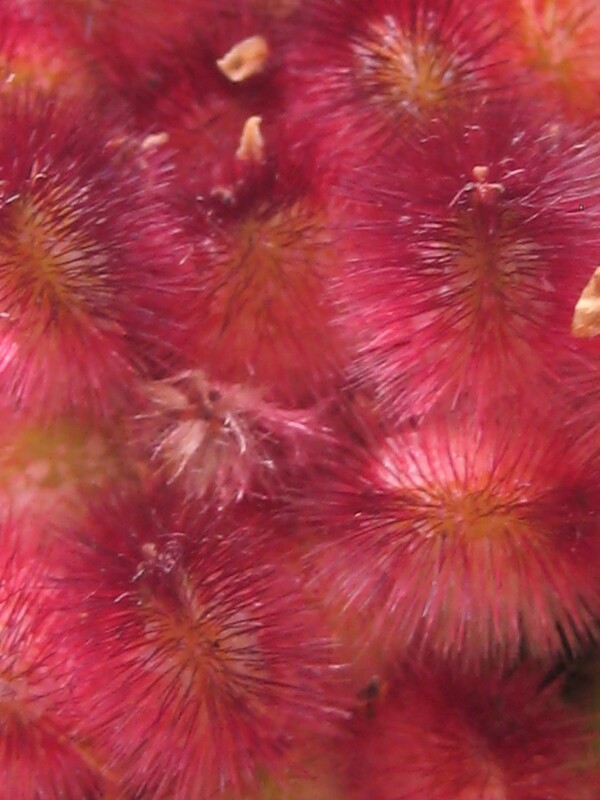 By 1629 a sumac was on display, showcased in a London garden of New World rarities. Soon sumac was being planted in royal gardens across Europe, dazzling kings and queens with its orange leaves and crimson berries every fall. Only wealthy aristocrats could afford such a magnificent plant. The sumac’s fifteen minutes of fame lasted for more than a hundred years. But all good things must come to an end. Alas, by the mid-1700s, birds had spread the seeds throughout the landscape, and sumac had become a dirt-common tree, affordable by anyone and everyone—with the result that no one bought it any more. The bright berries of staghorn sumac became a common sight along roadsides, an ordinary little tree that no one ever notices.